Macin Mountains are situated in south-eastern Romania, namely in northwestern Dobrogea, Tulcea county. 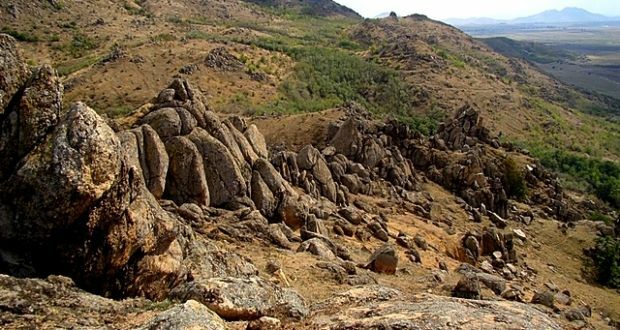 They are a subdivision of Dobrogea Mountains, one of the oldest mountains in Romania, being formed in the second part of the Paleozoic, during the Hercynian orogeny. Macin Mountains were formed 300-400 million years ago and the stories go that there were about 3,000 meters high and were part of a massif that stretched throughout Europe from west to east. The oldest mountain formations in Romania, Macin Mountains are now one of the protected areas of our country, getting the national park status. They are divided in Culmea M?cinului (the southern part) and Culmea Pricopanului (the northern part). The highest peak-467 meters- is ?u?uiatu (also called Greci). The Macin Mountains are the most arid mountains in Romania, having a very hot climate and dry summers, long and dry autumns and very cold winters with poor quantities of snow. With an altitude between 7 and 467 meters, these mountains provide a habitat for approximately 50 percent of species of plants and animals found all over Romania. Thus, here we can find over 1,700 plant species, out of which 72 are protected by law, 181 bird species, out of which 37 internationally protected, 47 species of mammals, 1,436 species of insects (out of which over 900 species of butterflies) and a variety of reptiles and amphibians. 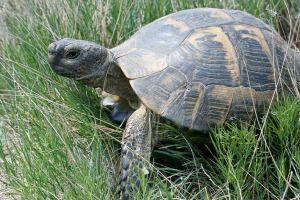 This area has a rich fauna, so if you pay enough attention, you can see an endangered species also declared a monument of nature, ‘the spur-thighed tortoise’ (broasca testoasa dobrogeana – Testudo graeca ibera). It is almost 30 cm long and 20 cm wide and when hibernation starts, in autumn, it buries itself 30-40 cm deep. It lives approximately 100 years. Within Macin Mountains National Park you can also find one of the oldest, most impressive and well-known reservations of our country – the Beech Valley Natural Reservation. It is characterized by the unique and strong presence of ‘Tauric beech’, which shows intermediate types between the native beech, Oriental beech and underwood flora, unique in Dobrogea and similar to Crimean beech woods. While in the area you can also visit: the Basilica with crypt, St. Athanasius Church, Paleo-Christian basilica with crypt, the Curative Fountain on Pricopan Crest, Dinoge?ia Roman-Byzantine fortress, Roman Citadel Noviodunum, Roman fortress Arrubium, Macin, Aegyssus Roman fortress.